All Banking Aspirants now have a brilliant opportunity to get a government job as a Clerk by cracking this year's IBPS Clerk 2018 Recruitment Examination. 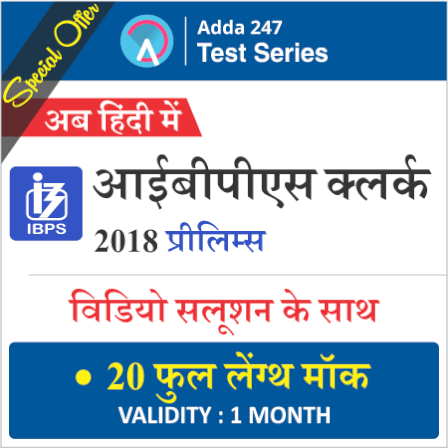 Adda247 brings to you IBPS Clerk Prelims 2018: Special Offer Test Series for your all round practice and preparation for IBPS Clerk 2018 Examination. 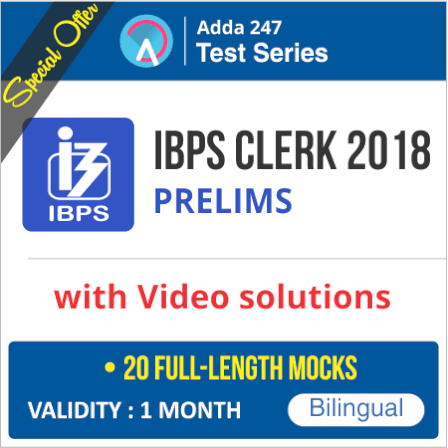 "IBPS Clerk Prelims 2018 with Video Solutions Online Test Series (Special Offer)" is available for Rs. 299 (separately for English and Hindi Medium students) in which you will get 20 Mocks for IBPS Clerk Prelims 2018. We, team Adda247, try to aid you with a platform that helps you succeed beyond the terms papers and standardized tests. IBPS Clerk Prelims Exam will be held on the 8th, 9th, 15th & 16th of December. So, a regular practice with speed tests is a must if you really want to get through this examination. And IBPS Clerk Prelims 2018: Special Offer Test Series will definitely help you bring it off this time. Get IBPS Clerk Prelims 2018: Special Offer Test Series Package (English Medium) Now!! Get IBPS Clerk Prelims 2018: Special Offer Test Series Package (Hindi Medium) Now! !